Turmeric Porridge is the perfect example of how you can help your health and fitness in other ways than just exercise - proven to work as an anti-inflammatory, and reduce cholesterol. If I start the day healthy, I'm more likely to carry on that way. Turmeric Porridge is an excellent way to do this. The Turmeric benefits our body by reducing inflammation and proven to treat and prevent a range of diseases and health conditions. Porridge benefits our body in many ways – helping to keep us fuller for a longer and benefiting our health. Oats are a low GI food meaning the sugars are released slowly over a long period of time, keeping blood glucose levels stable. The oats are broken down slowly, meaning the glucose just trickles in to the blood stream - rather than it all being dumped in at once. Whilst it is trickling into our blood we do not feel hungry. Conversely the sugars in white toast will be broken down relatively quickly and be dumped into the blood in one go. Insulin will be released to get this extra glucose out of the blood, but sometimes in the bodies haste to remove it - too much insulin can be released which subsequently causes blood sugar levels to then fall too low, resulting in feelings of hunger. This can happen in as little as two hours. Whereas porridge will still be drip feeding glucose into the bloodstream, keeping us with a ready supply of energy. I know this works – if I have porridge I make it through until lunch time without feeling hungry. Generally I have the small (cheap) oats – but if I add some of the bigger oats to the mix I may not feel hungry until mid afternoon. This does of course depend upon activity levels. However if I have toast I'm feeling hungry and wanting a snack after just a few hours. 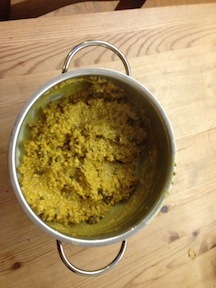 Adding turmeric to the porridge further benefits our body and can turn a boring dish into a vibrant yellow. It is a great way to get more turmeric into your diet. Don't forget to sprinkle a little black pepper in as well – this will enhance the effects of the active ingredient curcumin considerably.